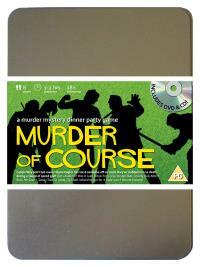 You've been invited to play the role of CHARITY BALL in Murder of Course. Glynn Eagles, owner of the prestigious Callow Way Golf Club, has just announced plans to build a new exclusive golf resort and is hosting a party to celebrate. However, during a round of golf before the party begins, Glynn is clubbed to death on the green of the 18th hole. Join us to find out who ended his round early! Events Co-Ordinator (like her husband Stryker, she likes to play a-round!) Costume Suggestion : You are the epitome of style and country club chic in your tailored designer-label skirt suit. Co-ordination is the key for you, and so your accessories – sunglasses, bag and gloves – always complement your outfit. Your high-heeled shoes aren’t exactly practical for the course, but they are this season’s must-haves. You’re sure you need no introduction as you’ve met everyone here at one time or another through your fundraising activities. You are in charge of social events at Callow Way. You’re proud to say that you’ve raised over a million pounds for good causes since you joined the club.